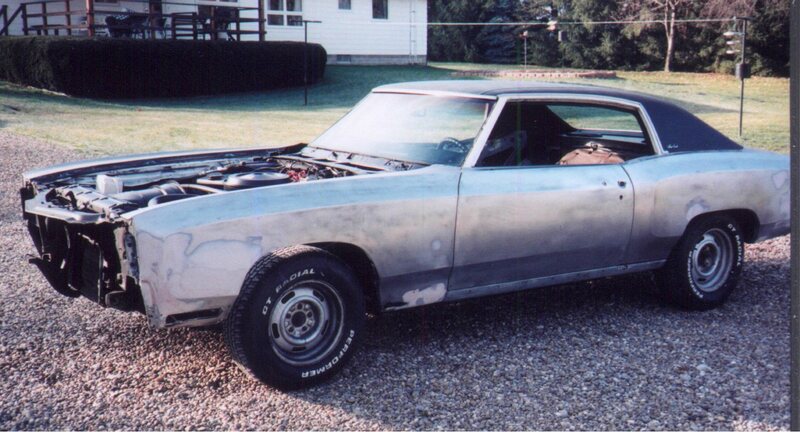 Here is my 1972 Monte Carlo as I bought it in 2000. Upon closer inspection you could see that the car had been painted at least once before and that quite a few dents had shown up over the years. Here in winter of 2001 we see the Monte Carlo has two coats of primer. Here is the Monte Carlo in late fall 2001 with all the chrome trim and paint removed. The car is down to bare metal. Also all of the dents and inperfections were taken care of. Very little rust was found. Here we see the Monte Carlo all done on a beautiful Febuary day in 2002. Painted Mediterranean Blue with a lot of new trim and new interior. I have to say a very big THANKS to my Dad. This evolution of color never could have happeded if not for his hard and precise work. THANKS DAD! !